At the Republican Jewish Coalition’s winter leadership retreat in Las Vegas, it was the absence of certain likely candidates for president that had the crowd most excited. While names like Sarah Palin and Michele Bachmann generate enthusiasm at some other conservative gatherings, their absence over the weekend here had the Jewish crowd giddy that ahead of the 2012 race, the Republican Party may be retreating from the divisive hyper-conservatives who have frustrated Jewish attraction to the party in recent years. At this GOP gathering the heroes were probable presidential hopefuls who are likelier to sway Jews from their traditional Democratic home and toward Republican candidates with positions on issues like the economy and foreign policy. Matt Brooks, RJC’s executive director, told a questioner that the social issues that have driven Jews away from the Republican Party in the past – abortion, gay rights, church-state separation – were hardly registering now. “Social issues get a large role in campaigns when there’s not a lot of other issues at the forefront,” he said. Instead, the issues now are America’s economic health and job loss, Brooks said. “That’s what will drive the narrative,” he said. The economy – and foreign policy, particularly Israel – certainly were the issues driving the narrative at the RJC event. The two likely candidates to address the audience in the open forum, Sen. John Thune (R-S.D.) and former Massachusetts Gov. Mitt Romney, wove both the economy and foreign policy into their challenges to President Obama, whom they and just about everyone else pledged to make a one-term president. Notably, neither man mentioned social issues. Both lambasted Obama for what they said was the distance he had established between the United States and Israel, breaking with a tradition of decades of closeness. The Obama administration has, in fact, condemned Hamas rocket attacks on Israel, although its tense exchanges with Netanyahu’s government over settlement-building have received much greater attention in the Jewish community. Thune said the administration’s emphasis on settlements made it appear that they were the reason peace talks were not advancing while ignoring Arab recalcitrance and the Iranian nuclear threat. Thune has said he is not running, but his supporters will not count him out and his appearance at this event and others like it fuels speculation that he may return to the race. Dan Lederman, a Jewish state senator from South Dakota, joked that he had already reserved the VP spot on the Thune ticket. Romney seemed transformed from his failed 2008 bid for the GOP nomination, when he was faulted for appearing scripted and uncertain in his opinions. He barely consulted a single sheet of notes, and spoke in detail not only on his strengths – health care and budget management – but about the threats facing Israel from Iran and about the peace process. He subtly cast what he undoubtedly will play as his strength – business and executive experience – into every topic. Obama, he said, does not understand negotiations, a lack that led him to concede too much at the outset to the Russians in negotiating a missile drawdown in Europe. “He could have gotten a commitment on their part, ‘We will not veto crippling sanctions on Iran,'” a reference to the Republican critique that U.N. sanctions approved last year on Iran were not sufficiently far-reaching. Instead, Romney said, Obama made it clear from the outset that he was willing to end missile defense programs in Poland and the Czech Republic, a key Russian demand. 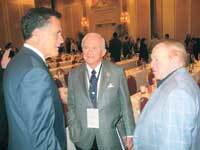 “The consequence of not understanding negotiations has been extraordinarily difficult,” Romney said. He also had a practiced answer on health care, facing a vulnerability that has dogged him until now: The plan he championed in Massachusetts, which reduced emergency room-generated costs by mandating health care, was a model for the plan passed last year by Obama and which Republicans want to repeal. One questioner asked Romney if, like Donald Trump – another putative GOP candidate – he would fight “scrappy” and not behave as a “gentleman” as he had done in previous campaigns. The reference appeared to be to Trump’s adoption of arguments questioning Obama’s citizenship credentials. Romney was adamant he would not stoop to “innuendo” in a campaign. The most telling moment in Romney’s appearance was when he called his wife, Ann, to the stage. “Mitt and I can appreciate coming from another heritage,” she said, referring to their Mormon background. That “another” was a sign of the difficulties that minorities have in assimilating into a party that is still perceived as predominantly white and Christian. The perception that “Republican and Jewish” is an oxymoron continues to dog the RJC, despite its successes, including upping the Jewish Republican vote from barely 20 percent in 2008 to more than 30 percent in November’s midterms. Much was made of a show of hands of first-timers at the confab – about a third of the room – and speaker after speaker urged them to bring friends and family. The event was held at Adelson’s palatial Venetian casino hotel, much of it taking place on Shabbat. Observant Jews who attended rushed from services, prayer shawls over their shoulders to events during the day Saturday, dodging oblivious, skimpily dressed cocktail waitresses attending to the crowds.